Showing items in category Swaziland, sorted by newest listed first. SWAZILAND - 1984 issued 20c green SWAZILAND POSTAL ORDER. 1984 (17.XII.) issued 20c green on cream SWAZILAND POSTAL ORDER cancelled MBABANE at issue office. Complete with counter foil and uncashed. SWAZILAND - 1988 issued 30c green SWAZILAND POSTAL ORDER. 1988 (18.IV.) issued 30c green on cream SWAZILAND POSTAL ORDER cancelled MBABANE at issue office. Complete with counter foil and uncashed. SWAZILAND - 1984 issued 50c green SWAZILAND POSTAL ORDER. 1984 (17.XII.) issued 50c green on cream SWAZILAND POSTAL ORDER cancelled MBABANE at issue office. Complete with counter foil and uncashed. SWAZILAND - 1985 issued E1 bright red SWAZILAND POSTAL ORDER. 1985 (30.IV.) issued E1 bright red on cream SWAZILAND POSTAL ORDER cancelled MBABANE at issue office. Complete with counter foil and uncashed. SWAZILAND - 1985 issued E2 bright red SWAZILAND POSTAL ORDER. 1985 (30.IV.) issued E2 bright red on cream SWAZILAND POSTAL ORDER cancelled MBABANE at issue office. Complete with counter foil and uncashed. SWAZILAND - 1932 4d red RPSE (size G) unused. H&G 1. 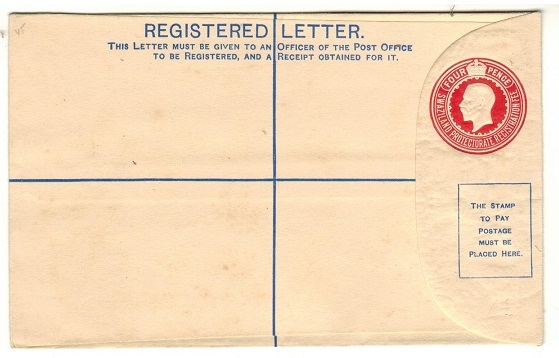 1932 4d red on cream registered postal stationery envelope (size G) in fine unused condition with 'THOS DE LA RUE & CO. LTD. PATENT' imprint under flap. H&G 1. 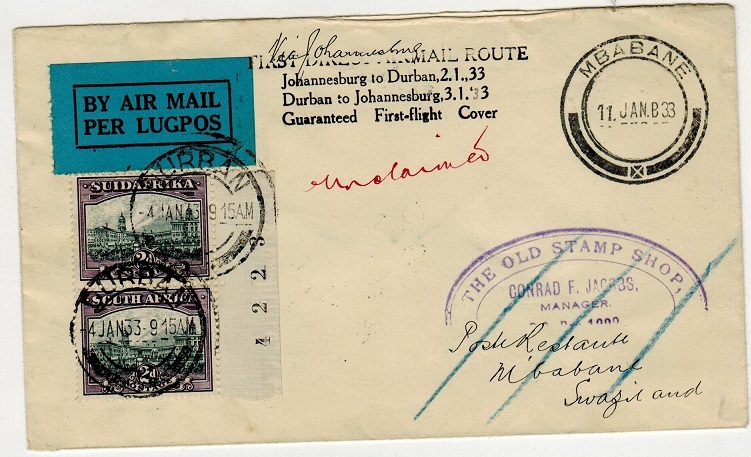 SWAZILAND - 1933 inward 'Unclaimed' first flight cover from South Africa. 1933 (3.1.) inward first flight cover from South Africa bearing 2d vertical pair tied DURBAN with MBABANE arrival cds dated 11.JAN.33. Cacheted in black FIRST AIR MAIL/DURBAN TO JOHANNESBURG/GUARANTEED FIRST FLIGHT COVER strike but the cover was not deleivered and marked 'Unclaimed' in red manuscript. A scarce stage. 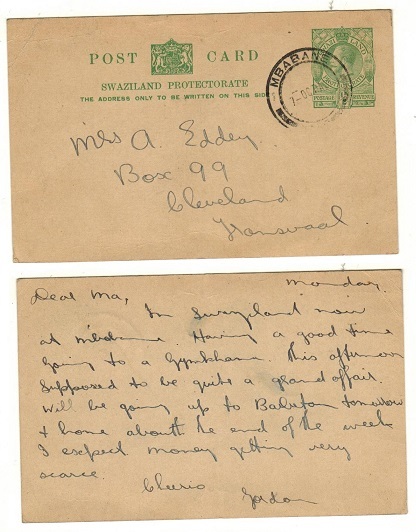 SWAZILAND - 1935 1/2d green PSC to Johannesburg used at MBABANE. H&G 2. 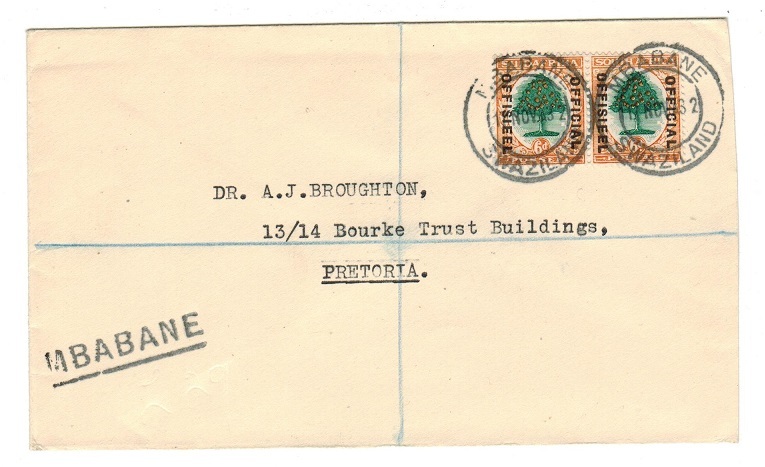 1935 1/2d green on buff postal stationery postcard addressed to Johannesburg cancelled by MBABANE cds dated 7.OCT.36. A scarce card used. H&G 2. SWAZILAND - 1980 (circa) dark blue on white 'FORMULA' RPSE unused. 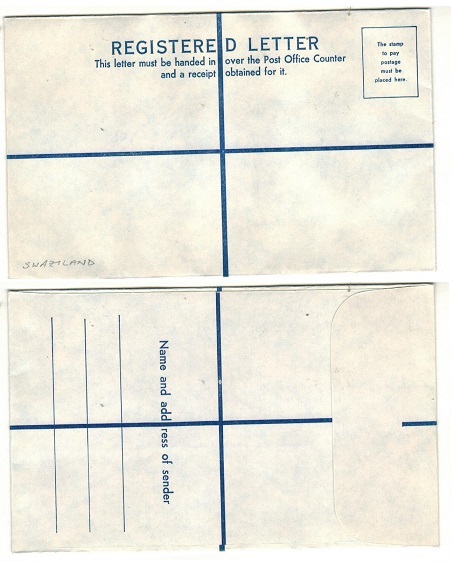 1980 (circa) dark blue on white FORMULA registered postal stationery envelope (155x96mm) in fine unused condition. 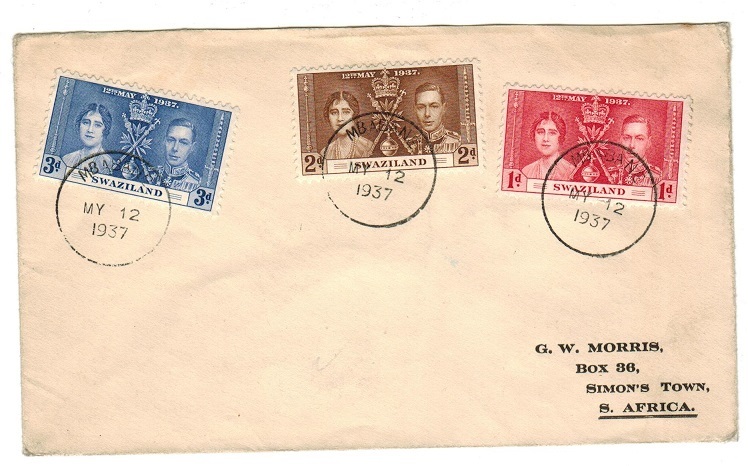 SWAZILAND - 1932 registered cover used locally at MBABANE. 1932 (NOV.17.) 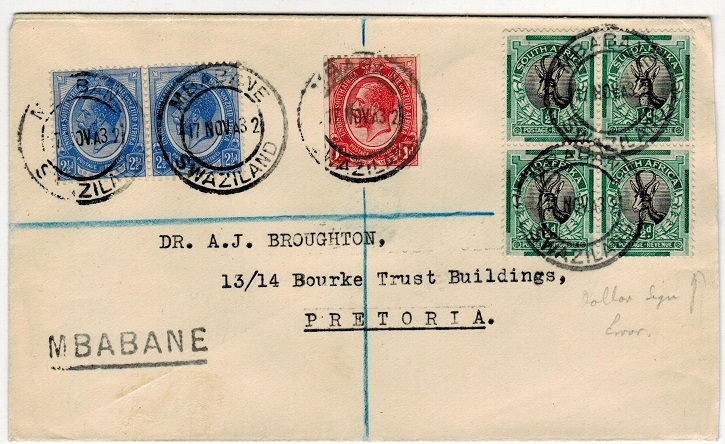 registered cover addressed to pretoria bearing South African 1/2d 'Springbok' block of four together with 1d and 2 1/2d (x2) 'head' adhesives tied by MBABANE/SWAZILAND cds's. Black straight lined MBABANE h/s at lower left. SWAZILAND - 1932 cover to South Africa with Natal 5d used at MBABANE/SWAZILAND. 1932 (DE.12.) 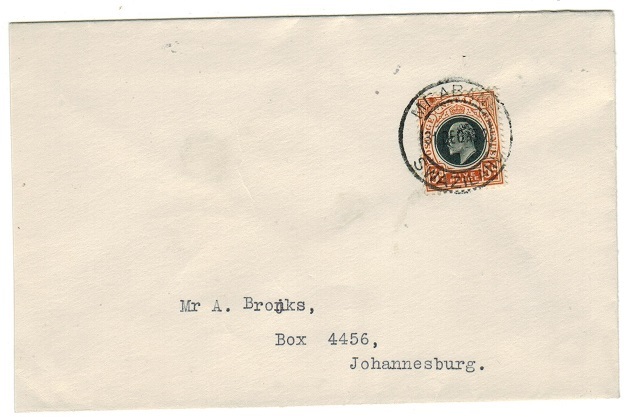 'Bronks' cover addressed to Johannesburg bearing Edward VII Natal 5d adhesive tied by MBABANE/SWAZILAND cds used on the last day of use for these adhesives. A scarcer 'Sunset' cover use. SWAZILAND - 1937 multi-franked local cover showing the rare MBABANE 'skeleton' cds use. 1937 (MY.12.) 'cto'd' local cover addressed to a 'B.B.Stewart of Mbabane' bearing GV 1d (x2), 2d (x4) and 3d (x4) adhesives each tied by the rare MBABANE ' skeleton cancellator used for just 6 days. This being the earliest know use of this strike. SWAZILAND - 1945 2d rate cover to Johannesburg used at KUBUTA. 1945 (MAY.15.) cover addressed to Johannesburg bearing 2d adhesive tied by large part KUBUTA cds (Proud type D2) with HLATIKULU transit b/s. 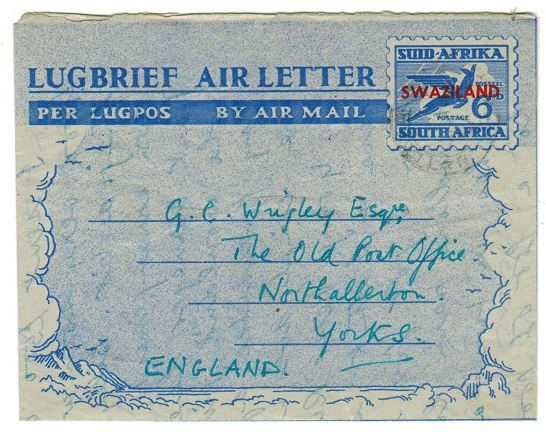 SWAZILAND - 1949 6d air letter to UK used at STEGI. H&G 8. 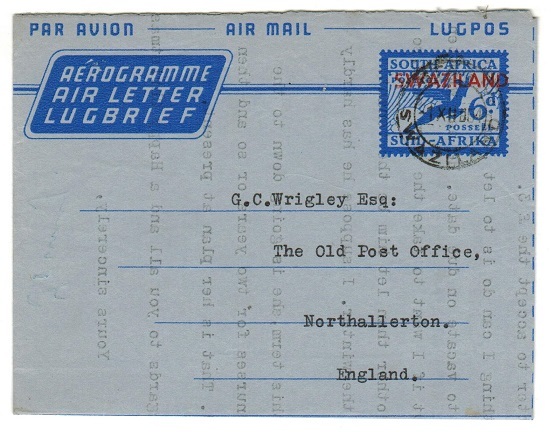 1949 6d ultramaine on white (blue inlay) postal stationery air letter of 'South Africa' overprinted SWAZILAND in red and with 'By Air Mail' logo addressed to UK and cancelled by STEGI/SWAZILAND cds dated 12.III.51. A scarce genuine use. H&G 8. SWAZILAND - 1951 6d air letter to UK used at STEGI. H&G 12. 1951 6d ultramarine on pale greenish white postal stationery air letter of 'South Africa' overprinted SWAZILAND in red addressed to UK and cancelled by STEGI/SWAZILAND cds dated 20.XI.52. A scarce genuine use. H&G 12. SWAZILAND - 1951 6d air letter to UK used at STEGI. H&G 13. 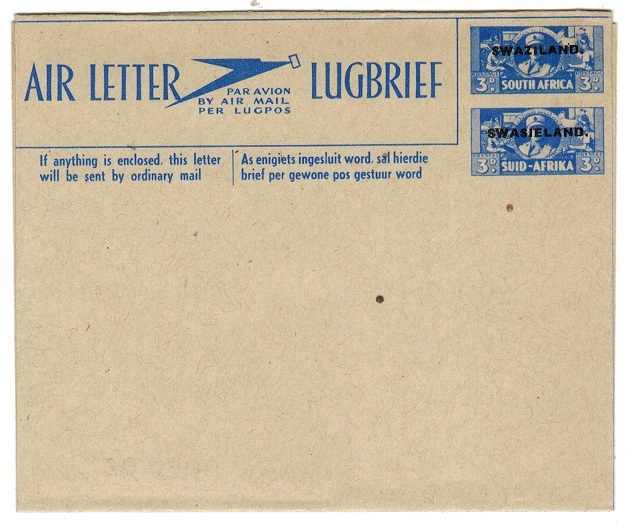 1951 6d ultramarine on pale greenish white postal stationery air letter of 'Suid Afrika' overprinted SWAZILAND in red addressed to UK and cancelled by light STEGI/SWAZILAND cds used on 24th August 1951. A scarce genuine use. H&G 13. 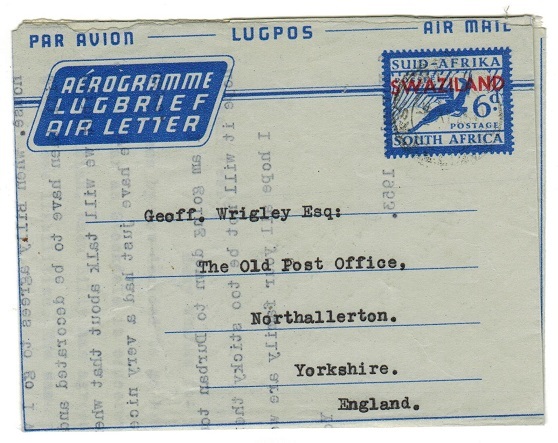 SWAZILAND - 1953 6d air letter to UK used at STEGI. 1953 6d ultramarine on greenish white postal stationery air letter of 'Suid Afrika' overprinted SWAZILAND in red addressed to UK and cancelled by light STEGI/SWAZILAND cds dated 6.NO.53. A scarce genuine use and unlisted on this paper shade by H&G preceding the issue date listed for H&G 15. Noted by Molen in his handbook on Swaziland. This must be a very difficult item so used as it was superceded the following year and few genuine used examples could exist. 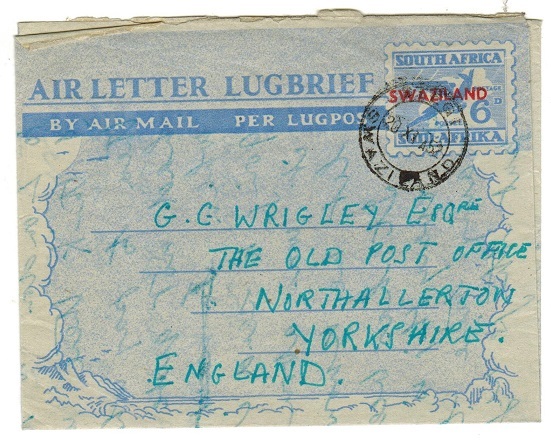 SWAZILAND - 1954 6d air letter to UK used at STEGI. H&G 14. 1954 6d ultramarine on light blue postal stationery air letter of 'South Africa' overprinted SWAZILAND in red addressed to UK and cancelled by light STEGI/SWAZILAND cds dated 1.XII.54. A scarce genuine use. H&G 14. SWAZILAND - 1889 1/2d grey (x2) used on piece with MISPLACED OVERPRINT variety. SG 4. 1889-90 1/2d grey (x2) tied to piece by squared circle BREMERSDORP/SWAZIELAND cancel dated 23.SEPT.93 and on ex album leave backing with both examples showing the overprint grossly misplaced to right reading 'AND SWAZIEL'. Scarce piece. SG 4. 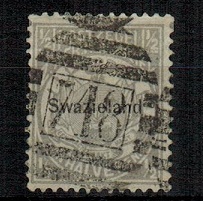 SWAZILAND - 1892 1/2d grey used with SLANTING OVERPRINT variety. SG 10. 1892 1/2d grey with SWAZILAND in red cancelled by near complete EMBEKELWENI cds dated 10.15.93 and showing the variety SWAZILAND ANGLED DOWNWARDS. Noted by Molen in his handbook on Swaziland. SG 10. 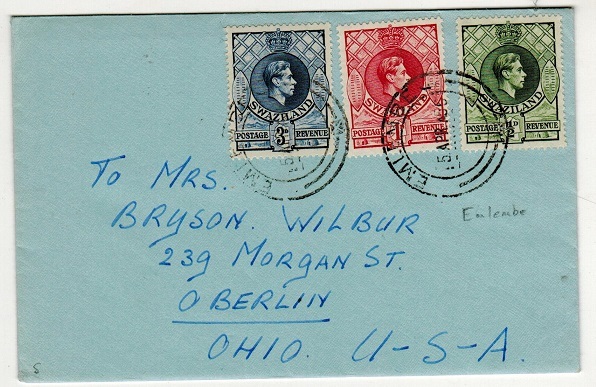 SWAZILAND - 1956 cover to USA used at EMLENBE. 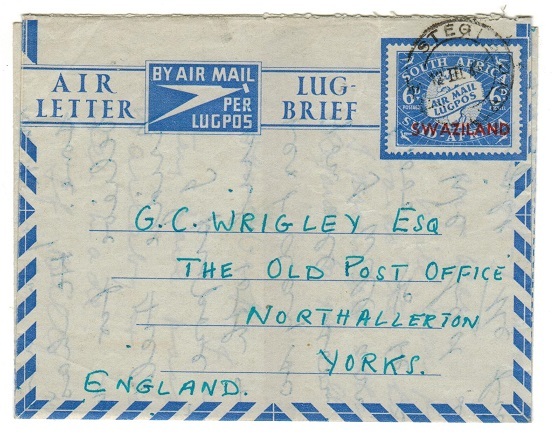 1956 (APR.5) cover to USA bearing 'KGVI' 1/2d, 1d & 3d adhesives tied by two EMLENBE cds's with original letter intact. (2 times). 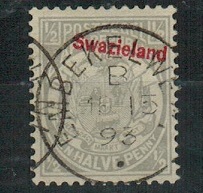 SWAZILAND - 1889 1/2d grey cancelled by '718' duplex. SG 4. 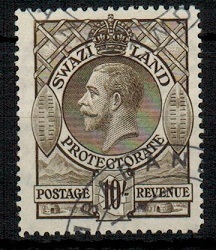 1889-90 1/2d grey with SWAZILAND in black cancelled by superb '718' duplex. This strike being used at Embekelweni. SG 4. 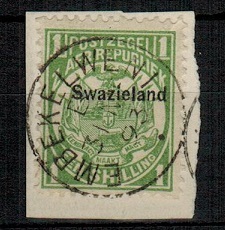 SWAZILAND - 1889 1/- green on piece cancelled EMBEKELWENI. SG 3. 1889-90 1/- green on piece and cancelled by complete EMBEKELWENI cds dated 31.MAR.93 with 'E' coding. SG 3. SWAZILAND - 1889 1/- green used with MISPLACED OVERPRINT. SG 3. 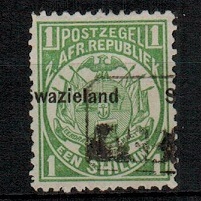 1889-90 1/- green cancelled by part REGISTERED box handstamp and showing the SWAZILAND overprint misplaced and reading 'WAZIELAND S'. SG 3. 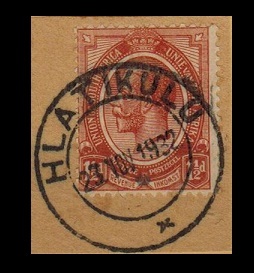 SWAZILAND - 1932 use of South Africa 1 1/2d adhesive used in HLATIKULU. 1932 (NOV.23.) use of South African 1 1/2d chestnut adhesive (SG 5) tied to piece by HLATIKULU cds. A scarce use of this South African stamp in Swaziland. SWAZILAND - 1918-32 Range of South African adhesives all used at MBABANE. 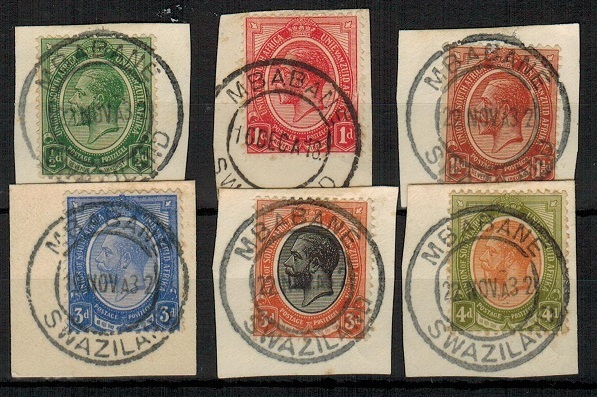 1918-32 range of South Africa 'head' adhesives each tied to piece by MBABANE/SWAZILAND cds's. Six stamps with 1/2d, 1d 1 1/2d, 3d blue (scarce) and 3d black and orange red plus 4d. A scarce array of South Africa stamps all used in Swaziland. SWAZILAND - 1932 use of South African 1/2d, 1 1/2d and 2d adhesives at HLATIKULU. 1932 use of South African 'head' 1/2d, 1 1/2d and 2d adhesives each tied to individual pieces by HLATIKULU cds's dated 23.NOV.32. Three scarce uses of South African stamps used in Swaziland. 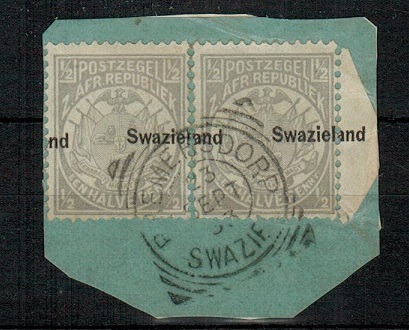 SWAZILAND - 1925 use of South African 2d strip of three at STEGI. 1925 (DEC.9.) use of South African 2d adhesive strip of three cancelled by two strikes of the STEGI cds. A scarce use of these South African stamps in Swaziland. 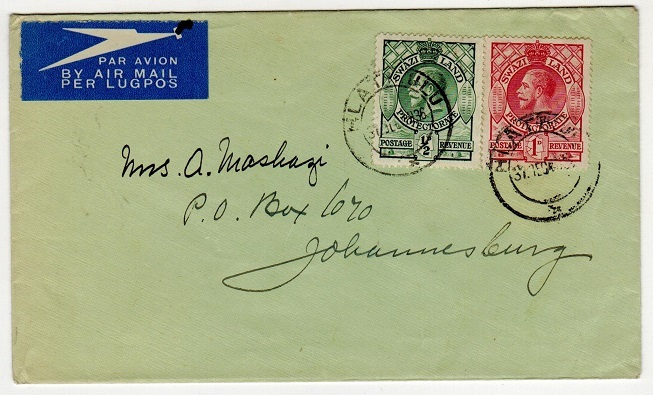 SWAZILAND - 1936 cover to Johannesburg used at HLATIZULU. 1936 (DEC.31.) cover addressed to Johannesburg bearing 1/2d and 1d adhesives tied by d/r HLATIZULU cds's. 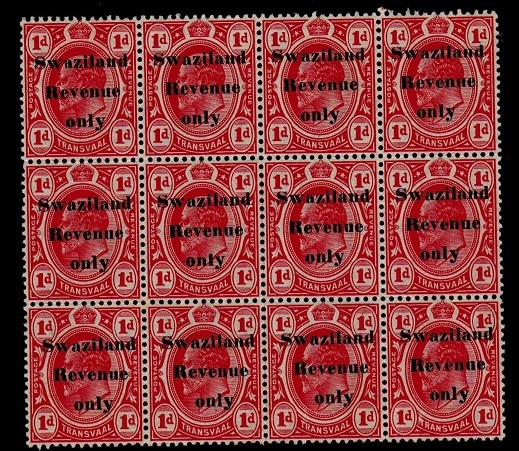 SWAZILAND - 1909 1d red SWAZILAND/REVENUE in a mint block of 12. 1909 1d red adhesive of Transvaal (SG 274) in a very fine mint block of twelve overprinted SWAZILAND/REVENUE/ONLY in black. Barefoot 37. A rare multiple. 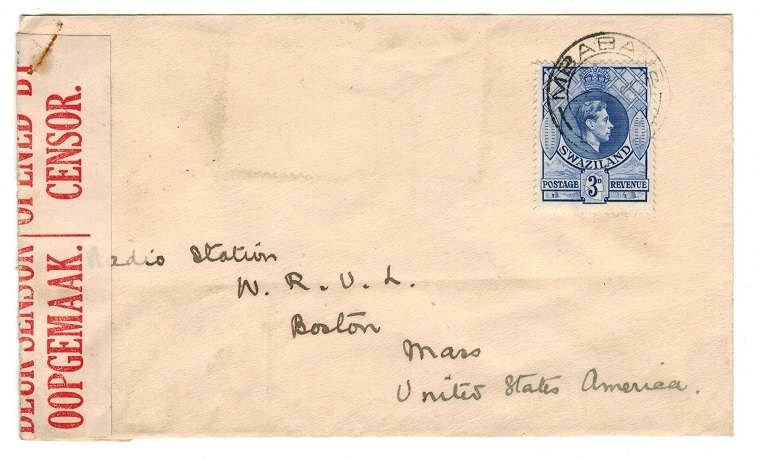 SWAZILAND - 1934 'Schmelzenbach Mission Station' 1/2d paper rate cover to USA used at PIGGS PEAK. 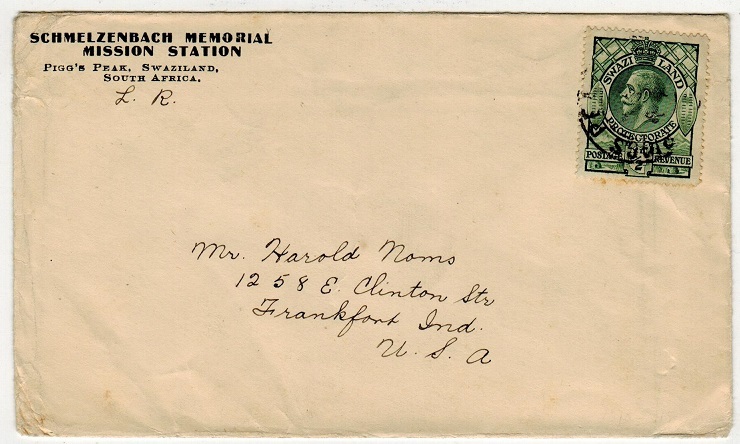 1934 'Schmelzenbach Memorial Mission Station' cover addressed to USA sent at the 'Printed Paper' rate bearing 1/2d green (SG 11) tied by part PIGGS PEAK cds. SWAZILAND - 1942 censored cover to USA used at MBABANE. 1942 (3.II.) cover addressed to USA bearing 3d adhesive tied by MBABANE cds with red on cream bilingual U.C.8 (large) / OPENED BY/CENSOR label at left. Swaziland mail being censored in South Africa. SWAZILAND - 1944 2d rate local cover used at HLATIKULU. 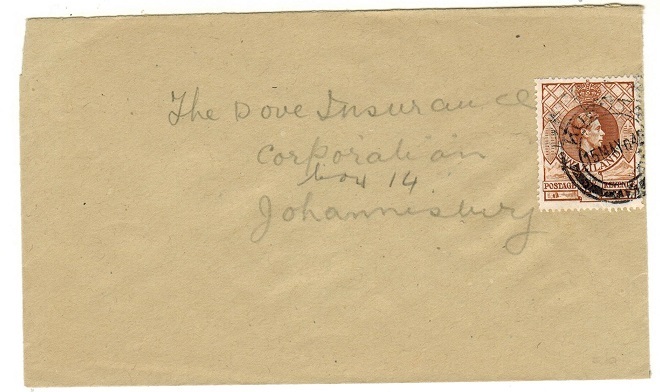 1944 (FEB.16) cover to South Africa bearing 1d pair (SG 29) tied by d/r HLATIKULU cds. SWAZILAND - 1933 10/- sepia with MBABANE cds. SG 20. 1933 10/- sepia in very fine used condition cancelled by MBABANE/SWAZILAND d/r cancel but possibly of a official departmental nature. Unusual strike. SG 20. SWAZILAND - 1932 South African OFFICIAL 6d pair on cover used at MBABANE. 1932 (NO.11.) registered cover addressed to Pretoria bearing South Africa 6d bilingual pair overprinted OFFICIAL (SG 016) tied by MBABANE/SWAZILAND cds's. SWAZILAND - 1937 'Coronation' FDC struck by rare 'MBABANE' skeleton cds. 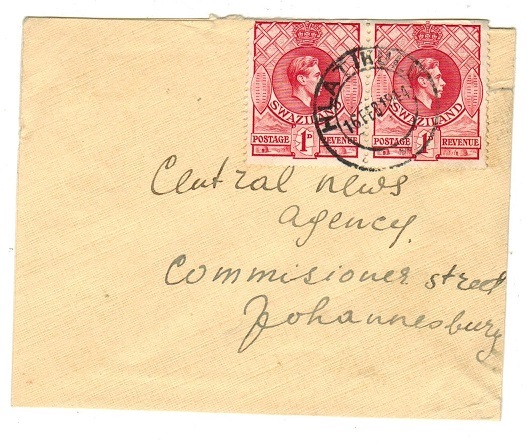 1937 (MY.1.2) first day cover addressed to South Africa bearing the 'Coronation' trio tied by by the scarce s/r 'MBABANE 'skeleton' cancellator. Proud type D14 limited use of just six days. 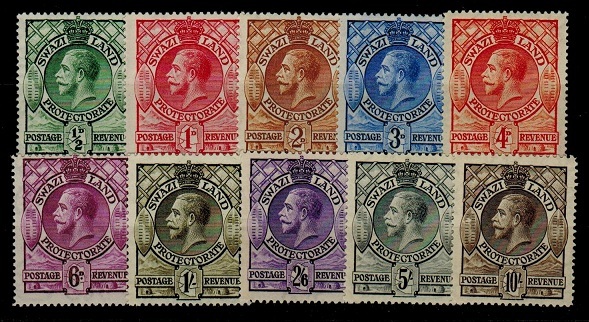 SWAZILAND - 1935 'Silver Jubilee' set unmounted mint. SG 21-24. 1935 'Silver Jubilee' set of four in fine unmounted mint condition. SG 21-24. 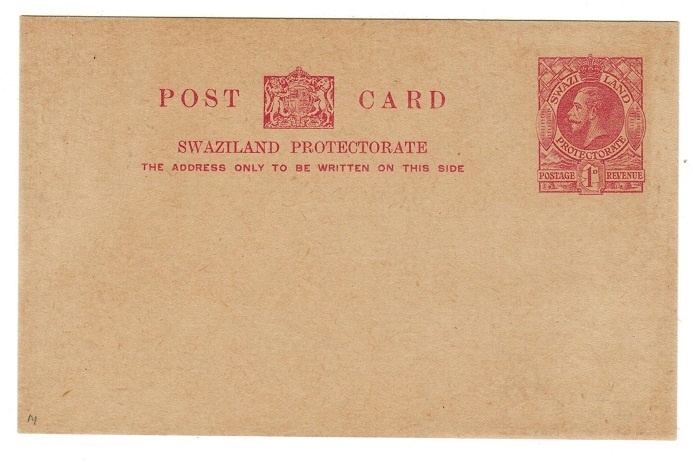 SWAZILAND - 1932 1d PSC unused. H&G 1. 1932 1d carmine on brownish buff postal stationery postcard in fine unused condition. H&G 1. 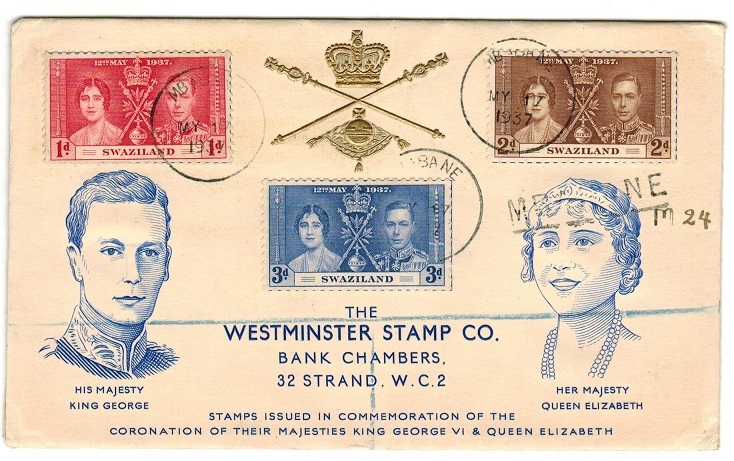 SWAZILAND - 1937 registered 'Coronation' cover to UK with rare MBABANE 'skeleton' cds use. 1937 (MY.17.) illustrated 'Coronation' cover registered to UK bearing the Coronation trio each tied by rare s/r 'skeleton' MBABANE cds in use for just 6 days. (Proud type D14). SWAZILAND - 1937 'Coronation' FDC used at EZULWINI. 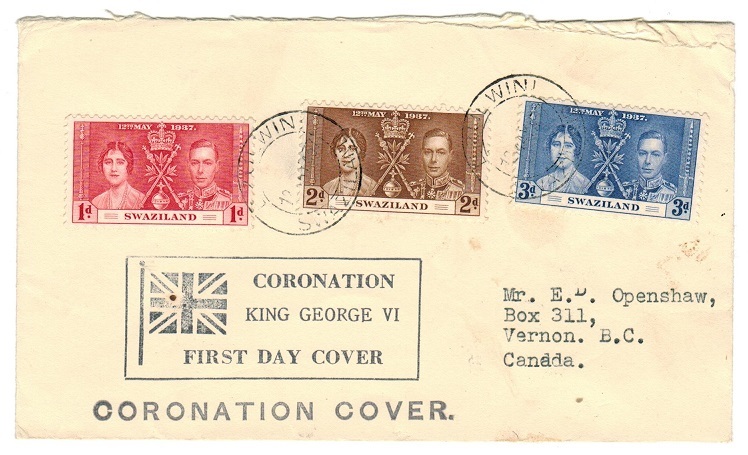 1937 (MAY.12) Coronation trio (SG 25-27) tied to First Day Cover to Canada by two EZULWINI cds's. SWAZILAND - 1944 3d+3d blue on buff postal stationery air letter unused. H&G 1. 1944 6d (3d x 2) ultramarine on buff postal stationery air letter of South Africa overprinted in black SWAZILAND/SWASIELAND in fine unused condition. H&G 1. SWAZILAND - 1935 6d 'Silver Jubilee' mint block of four with EXTRA FLAGSTAFF variety. SG 24a. 1935 6d slate and purple 'Silver Jubilee' fine mint corner marginal block of four (very lightly overall toned) showing the EXTRA FLAGSTAFF variety on Row 9/1. SG 24a. 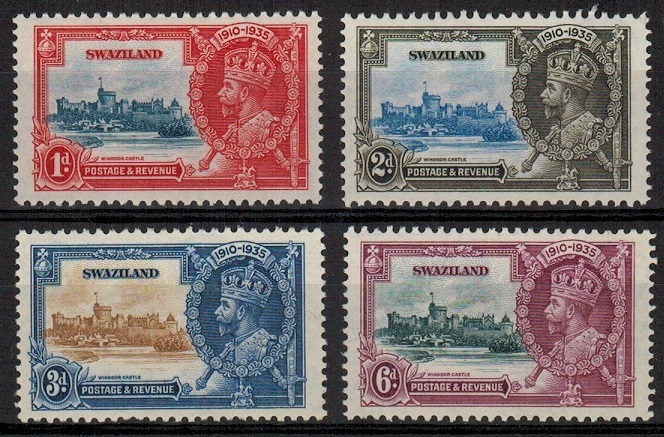 SWAZILAND - 1933 set of ten in mint condition. SG 11-20. 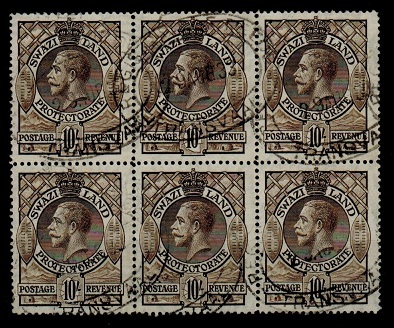 1933 Series of 10 values in very fine mint condition. SG 11-20. 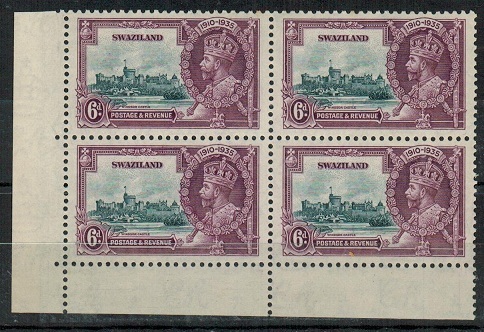 SWAZILAND - 1933 10/- (SG 20) block of six cancelled REGISTERED/TRANSVAAL. 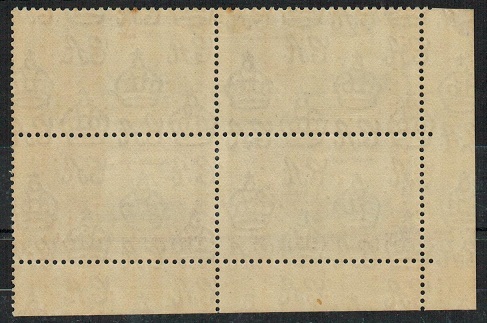 1933 10/- sepia (SG 20) in a block of six cancelled by oval REGISTERED/TRANSVAAL revenue cancel dated 29.AUG.33. Unusual item.